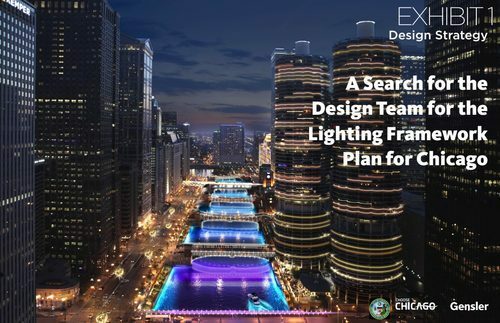 International Design Competition: The City of Chicago Searches for a Design Team for the Ambitious ‘Lighting Framework Plan’ aka the next “City of Lights” following the principles of Paris, France. The chief procurement officer for the City of Chicago at DOB (Department of Buildings) briefly introduced the number of volumes, phases per volume, requirements, and deadlines for the project submittal. Three representatives of the LFP (Lighting Framework Plan) team and architects from Gensler presented the goals, design intent and concepts behind the lighting framework plan. Part 1 presented the goals for a global destination, increase Chicago’s visibility as the main objective, and enrich resident and tourist experience as the vision. The design strategy will include iconic structures, light needing darkness, synaptic network, sustainability, energy innovations, bird migration, and the Chicago network. 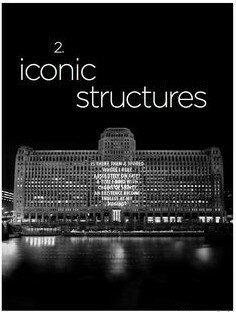 Specifically, the strategy would incorporate usage of the Merchandise Mart as an iconic structure. Light would complement darkness as a cohesive function in connecting tourist attractions. Synaptic network would include interconnected neurons which define a recognizable linear pathway for lighting. The 2030 Sustainable Action Agenda and energy innovations would be incorporated as well. Strategy part two would include the scope of work focusing on more city opportunities for land, water, and air. These opportunities presented are in reference to the lake, the sky, the city grid, and below grade elements of the tunnel and the water. The next part of the strategy presentation depicted design elements connecting major infrastructures. The river, iconic structure, bridge, el, and lower wacker drive would guide a path for tourist attractions and residential experiences. These represent a vehicle for the lighting framework plan. The presentation gave examples pertaining to the elements including the reversal of the river and city-wide future initiatives for the Riverwalk. 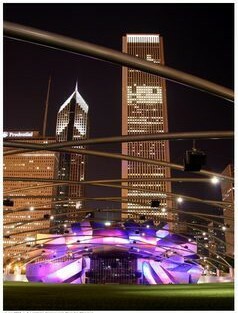 Iconic structures such as the Pritzker Pavilion, still standing after the fire of 1871 and the modern Aqua Tower are other elements defining the Plan. There are 180 working bridges in the city. The trunnion basule rotates on the shore. The Wells Street bridge was the first steel bridge after the fire, then it was a swing bridge, then steam powered and now it runs on electricity. This bridge now carries trains and ties the Loop into the city. The El has 8 routes. Lower Wacker Drive was part of the double deck roadway plan of the Burnham Plan 1909. This element was meant to decrease traffic congestion. Famous movie scenes were staged at Lower Wacker including Blues Brothers with John Belushi and the Dark Knight with Christian Bale.